What is the Smarter Travel Initiative? The Healthy Trinity: Smarter Travel Initiative encourages students and staff to walk, cycle or take public transport to Trinity. The website has maps with walking and cycling times to and between Trinity campuses, details of Public Transport Apps to get you around Dublin easily and information on the walking and cycling challenges with prizes galore that we run every year. Healthy Trinity: Smarter Travel is a partnership with the National Transport Authority. It implements Trinity's Sustainable Development Policy and was launched by the Provost, in November 2011. Healthy Trinity is working with the National Transport Authority to make Smarter Travel easier for students and staff. We aim to make walking, cycling and using public transport a simpler option for people. 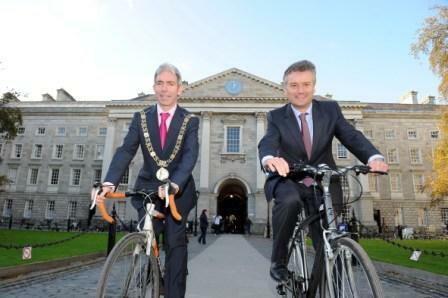 Each year, Trinity participates in the Smarter Travel Campus walking and cycling challenges. The Smarter Travel Trinity Initiative is managed by a committee of Trinity staff and students. It includes representatives from Students and Graduate Students Unions, Estates & Facililities, College Health, Trinity Sport, Human Resources, the Green Campus Committee, Communications and St James's Campus Committee. It is being run in association with the National Transport Authority's Smarter Travel Workplaces Initiative. Please phone reception on the number below. We cannot guarantee service by email.